Each of those is frequently undergoing changes and improvements. The latest change to the talking points, for example, introduces three elevator pitches to help you quickly explain openSUSE to people. Input (preferably in the form of fixes to the linked wiki page!) is of course welcome. The artwork repository offers lots of poster- and flyer artwork as well as a number of ready-made presentations. Unfortunately git, which is where this is all hosted, is not super-nice as a way to distribute content. The presentations are up to 25 mb, which you can't download from gitorious directly... Luckily, Bruno "Tigerfoot" Friedman has set up a nice mirror where you can download the presentations. The Ambassador portal on the wiki leads you to lots of good resources, like how to organize an event. So, ambassadors, use what we have - and let us know if it works for you or even better - just improve it! 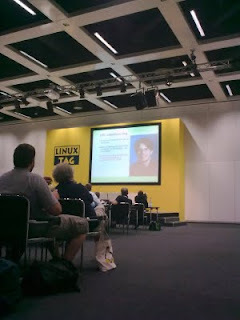 Last week openSUSE had 30 Geekos at LinuxTag in Berlin. Awesome times, with the exception of the last day when we figured out the power supplies of our nice big touchscreens were stolen... And to think the thieves left the beamer?!? But aside that little snag, we rocked. At the booth we had mini-presentations, which weren't as successful as last year, but the 15 presentations we gave in the big rooms worked out just fine. 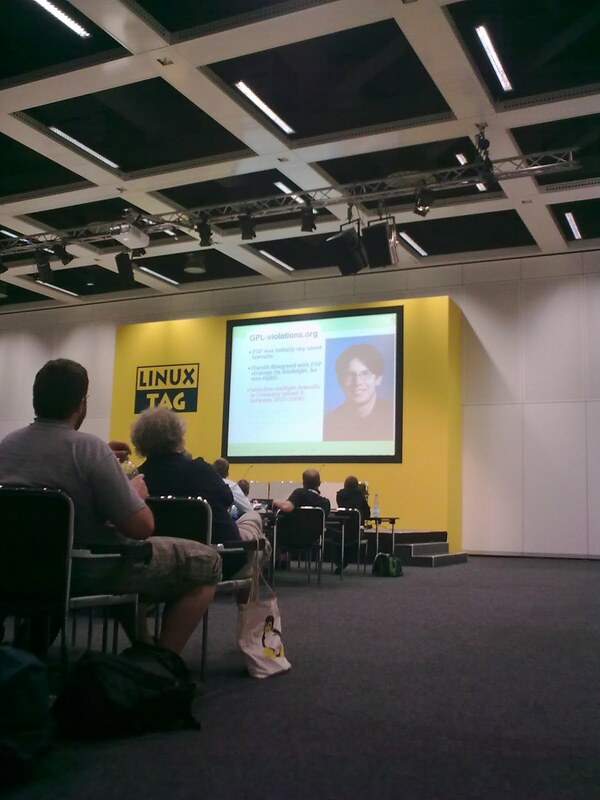 Of course, Vincent Untz had to give his cross-distribution ollaboration talk as first presentation on the day after the party and my own openSUSE 11.4 intro was scheduled at the same time as fellow Geeko Eckhart's talk about Wayland. Still, I'm quite sure we got the word out on openSUSE. 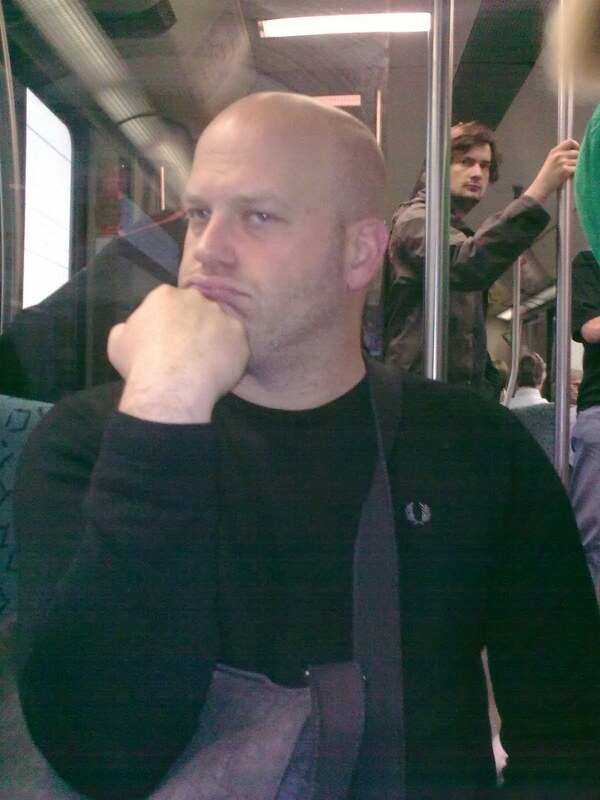 Especially when it comes to 'openSUSE is more than a distro'. Personally, I feel more and more strongly on that subject. Presenting openSUSE 11.4 is nice - we've got some interesting things there, but honestly - what is really so special about the specific kernel or LibreOffice version we ship? I feel a lot happier telling people about Tumbleweed or OBS! The relatively minor differences between the distro's became especially visible on the last day, when we had a 'distro shootout' or something like that. A row of distributions, from well-known Ubuntu and Fedora to smaller distro's like Kanotix, was put on stage, represented by someone from the project. A task was given and each had to execute it, showing what their distro had going for it. In short, most 'unique' features aren't that unique or only really interesting for a few power users. And then the GUI tools. Ubuntu showed their easy to use Software Center. Debian showed synaptic so the third Debian derivative Kanotix settled demoing some scripts they used for auto-installing things. Mandriva has their own graphical UI and points for Fedora - they demoed PackageKit which is cross-distro. I decided to show how you can always reach YaST - from the commandline (ncurses), GUI (GTK & Qt) and web (webYaST). Oh, and our awesome games store nobody knows about... But to me, it all feels a bit marginal. Basically, it was one big show of how AppStream is the right thing to do! Take Ubuntu's easy GUI, Fedora's Packagekit & the Debian screenshots, combine it with OCS' awesome social features and have ONE really good tool to rule them all. Or rather, benefit all. For the average end users, most differences between the technical products on Linux are not relevant anymore. Even 'minor' distributions have progressed to the point where they are good enough! It is all about collaboration - that is how we can get further, together! After all, our real competition aren't other distributions but Microsoft and Apple. On that last note, I'd like to publicly ask Canonical and especially Mark to deeply consider getting rid of the Copyright Assignment for the Software Center. It is a blocking issue for real collaboration and as you consider it Bug #1 to get rid of MS' majority market share, why not put your money where your mouth is and work with the other distributions to do something about that? I went to LCA 2011 in Januari. There, a 'mild controvercy' (or rather 'nuclear war') developed around a keynote by Mark Pesce and how it was handled by the conference team. Now personally, I had little issue with Mark's keynote. Ok, there was some harsh language and some explicit imagery, but nothing that offended me. So when an apology was made during the closing ceremony, I was suprised and later on spoke out with some others against the 'censorship'. But after a while I realized that the point of all this isn't about censorship or Freedom of Speech (vs freedom of 'not being insulted'). Those issues surely play in the wider, public area. I don't want to have laws which allow our government to prosecute anyone who talks about something they don't like! But that is not relevant here. LCA is NOT a public place. It is a conference organized by a team which has EVERY right to tell us under what condictions we can join! It is their conference, after all. And yes, one of those conditions is that we are supposed to watch what we say so we ensure a welcoming place for everyone. As I've already been convinced that we do need to think about diversity, openness and anti-harassment after reading this LWN article about the darker side of open source conferences by Valerie Aurora, I've decided to draft up a Code of Conduct for the openSUSE Conference today. You can find the Code of Conduct draft on the wiki and would love input! I'll be going to two VERY different events this month: Linux Tag with thousands of visitors and a big openSUSE team and the Dutch HCC Linux Themadag which I expect to be slightly smaller - by a factor of 10 or so. I'm not really sure what kind of event I like most. At LinuxTag I'll probably be more busy to talk to people who know a fair bit about Free Software, get interviewed, discuss things with other FOSS people in many one-on-one or small meetings etcetera. At HCC, well, there will be few people I know and most visitors are probably quite new to Linux. I really look forward to meeting the dutch openSUSE people (most of whom I don't know yet) and yes, I always enjoy talking to newbies. 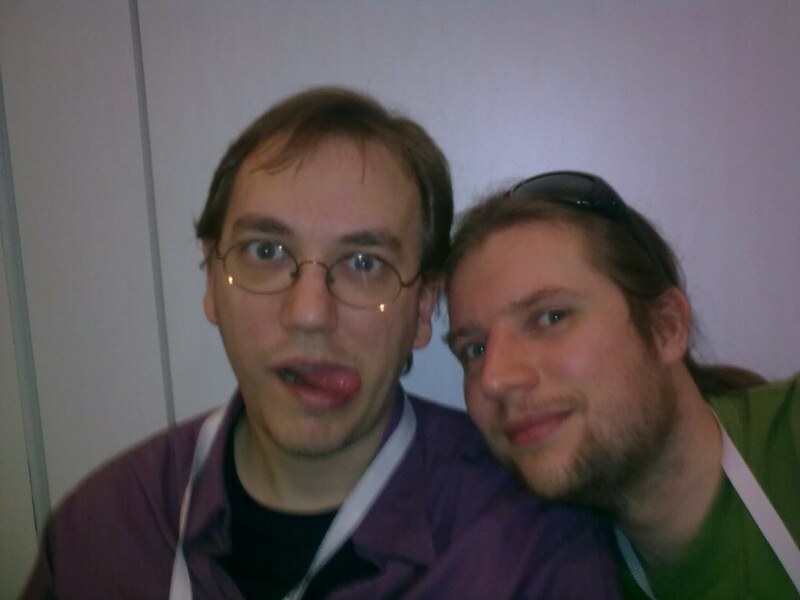 But LinuxTag has lots of friends, both from within openSUSE and from other projects - that's also awesome. I think I'm gonna decide that they're both equally cool. And if you live close to either, be sure to be there & say hi to me! If you want to pick me out of the crowd, a helpful tip: my hair (both on head & chin) got a bit longer since the pic above was taken!